When I found out I had cancer and thought I was going to die I was surprised little changed. All I wanted to do was live the life I was already living. I was happy with my life and (most of) the decisions I’d made. There’s an article in the NY Times about Senator John McCain. 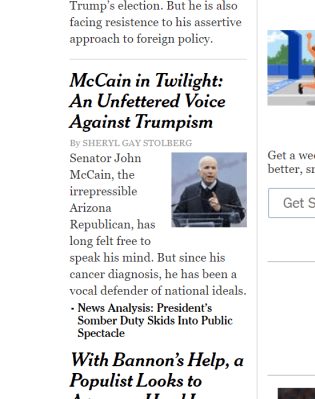 The article makes the argument McCain’s changed since his diagnosis of what’s incurable brain cancer. the 81-year-old senator has found a new voice. “Do I hear in his voice a little bit more expression of grander ideals? I do,” said Senator Bob Corker, Republican of Tennessee. in a dramatic return to Congress after surgery to remove a blood clot above his left eye, he delivered a harsh critique of the Senate as he called for Democrats and Republicans to work together. It’s possible McCain’s cancer was a sobering moment that changed his attitude. It’s just not something I can vaguely relate to. I am saddened by his terrible illness, but if McCain really does have to make radical shifts, I’m also disappointed. None of us are going to be here forever. Be a good person today. Great advice Geoff. I’m still missing you on WTNH tease, I sincerely wish you good health and happy days. Please consider returning to CT airwaves (dated myself) if the offer is made. Trust me, their inbox and mail tubs are full. It is possible that McCaine has taken a good look at himself and he is rethinking what way things seem to be going. Let’s hope he is now walking the straight and narrow! Maybe his shift is because he knows in his heart the Trump’s administration replacement of the Affordable Care Act would be a death sentence for thousands of people. That’s why he voted ‘no’ twice. Please come back. The current weathermen don’t have it. Plain and simple. I used to think it was all of you…Mel, Nancy, Sally Ann… but it was really you. Come back. Connecticut isn’t Connecticut without you. The weather isn’t excited if you don’t feebly attempt to predict it. You tamed Connecticut winters as best as anyone could. Come back my friend. Just leave us abandoned and in the incapable hands of the plastic forecasters of today. Here Here!!! I completely understand that your life is all in Irvine, but we lost a part of ourselves when we lost you Geoff. There is NOBODY that can hold a candle to your personality, humor, or abilities when it comes to on-camera or voice over presentations. Your summer visit to our homes was just grand, but it served to remind us of the good old days. If only it were in the cards that we could have you back, even remotely, would make most Nutmeggers happy beyond words. I/we wish you good health, happiness, and great Holidays. We miss you too for words.